Sometimes when I travel and look for a place to stay, I just need a shower and a bed. But other times, the lodging is the main draw, or at least plays a starring role in the trip, reflecting an area’s history and character, perhaps, or offering a unique experience. Keep in mind that these places tend to be small or in out-of-the-way locales (or both), so reservations are a good idea. Here are a few of my favorites. Coming around a curve on Business 59 just outside Wharton, I’m greeted by a row of 10 teepees arranged across an open field. Built in 1942, this unusual motel is one of the few survivors of the American heyday of car travel and motels. It closed in the 1980s, then was restored by lottery winners Barbara and Bryon Woods and reopened in 2006. Each teepee is a separate room, small but complete; the bathroom takes up about a quarter of the round structure and the rest of it is surprisingly spacious, with a full-size bed, nightstand, couch, desk, chair, refrigerator, and microwave. After spending the day at the beach (just an hour away), we eye the grill outside our room but pop into town for a take-out pizza instead. While we eat our pie, we watch kids play under an oak tree and among the “art arrows”—their shafts nearly as thick as telephone poles. 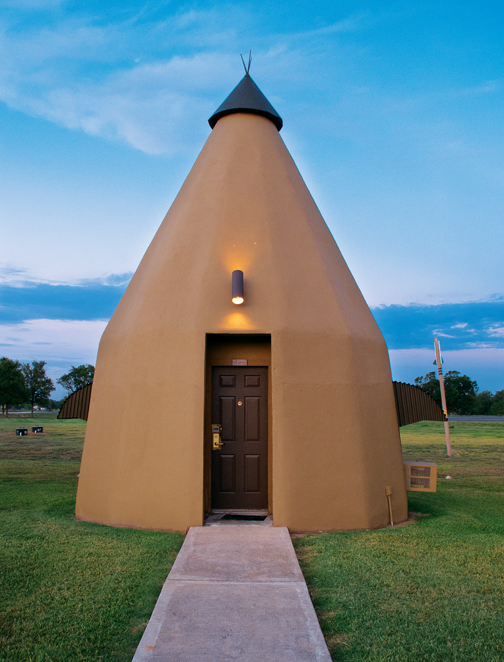 The Teepee Motel brings back memories of a childhood filled with classic Westerns and a weekly dose of Gunsmoke. When the sun goes down and I finally drift off to sleep, I swear I hear horses nickering outside. Nearby: Matagorda Bay Nature Park, Brazos Bend State Park, Wharton Riverfront Park, Colorado River. To reach the Teepee Motel, call 979/282-8474. Austin hotelier Liz Lambert grew up spending time at a family ranch near Marfa, a place that she says evokes a sense of freedom and inspires creativity. When 18 acres came up for sale there, she envisioned using it to escape from city life, sleeping on the land beneath a sky full of stars. She began to dream of creating a public retreat called El Cosmico, named for a place she remembered in Mexico. “For years, we kicked around on the land, seeing the natural flow of where things should be, playing with different ideas,” Lambert says. “One day, we just decided to go for it and open our doors and see how it went.” Guests can now choose from an eclectic assortment of accommodations, including restored 1950s trailers, canvas safari tents, yurts, and a 19-foot-tall teepee, which may be the only one on the planet with a king-size bed. There’s also an outdoor cooking area with a refrigerator, sink, hot plates, and grills, as well as picnic tables and hammocks. Camping is allowed on the grounds, and the owners planted trees to provide shade during the day. You won’t find televisions at El Cosmico, but who cares? You’ll enjoy excellent stargazing at night, conversation on the porch or around one of the fire pits, and that authentic Marfa vibe—mellow, relaxing, and just a little offbeat. Nearby: Marfa art galleries, Marfa Lights Viewing Area, Davis Mountains State Park, McDonald Observatory, Big Bend National Park. To reach El Cosmico, call 432/729-1950. One of the most significant historic sites in Texas, Presidio La Bahía near Goliad offers overnight lodging in the fort’s former officer’s quarters. Just south of the town of Goliad, Presidio La Bahía looks out over the green ribbon formed by the San Antonio River. Standing here, with a clear view of the countryside as sunset sends pink streaks across the sky, I can see why Spaniards arriving in 1749 chose this piece of high ground to build a fort to protect their new community of La Bahía. 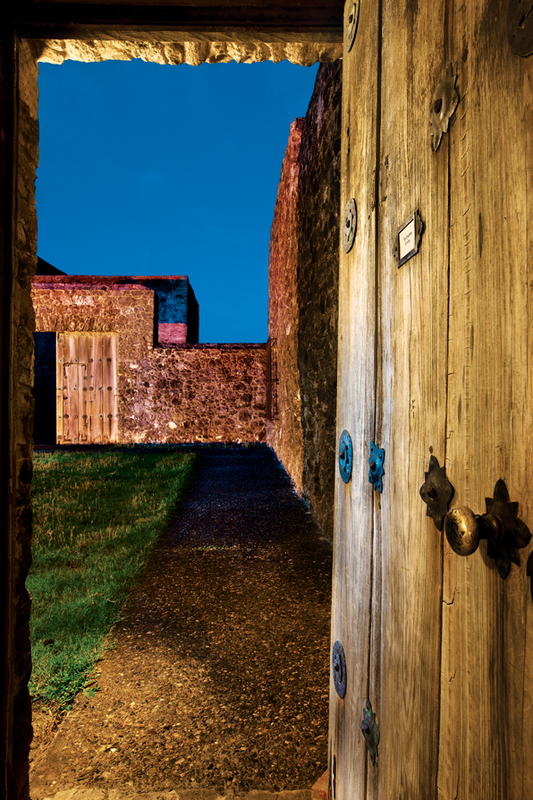 The Presidio, the oldest standing fort west of the Mississippi, contains a museum and a still-active Catholic church—and offers lodging in a two-bedroom, stone apartment that used to be part of the officers’ quarters. In the waning light, the old church fades into a black silhouette as I walk to my room. I pull open the heavy wooden door, which creaks like an old saddle, and enter the storied stone lodging, which has a full kitchen equipped with colorful Mexican pottery, a sim-ple living area with a sofa and fireplace, and brightly patterned blankets on the beds. In 1829, the name of the settlement that grew up around the fort was changed from La Bahía to Goliad, an anagram of the name of Father Hidalgo (without the silent “h”), who launched the Mexican fight for independence from Spain in 1810. Then, during the Texas Revolution, on March 27, 1836, Texian Colonel James Fannin and more than 300 of his men were executed by Mexican troops at the Presidio. After the victory at San Jacinto in April, Texian troops buried the remains of those killed here, and eventually the town moved to its present location across the river. In 1938, a monument was dedicated over the mass grave. Some claim the fort is haunted, but I feel no supernatural presences—just a sense of the significance of the events that took place here. Nearby: Goliad Paddling Trail, Goliad State Park & Historic Site, Fannin Memorial Monument, Fannin Battlefield State Historic Site. To reach the Presidio, call 361/645-3752. Early-morning sun bathes a still pond in golden light. A horned antelope steps from the trees and walks cautiously to the water, creating ripples across the surface as he drinks. A line of ibex, bearing the species’ signature ebony stripes on their flanks, approaches from another direction. I rub my eyes and reach for my camera, sliding open the door to my room at Fossil Rim Wildlife Center near Glen Rose. One of a half-dozen structures designed to look and feel like African safari tents, it has solid walls beneath the canvas, as well as twin beds, a full bath, electricity, and air conditioning. A nonprofit organization involved in a worldwide program of captive breeding of endangered and threatened animals, Fossil Rim is home to some 50 different species, from addax to zebras. The tents, found in an area of Fossil Rim called the Foothills Safari Camp, provide ideal spots for watching some of these animals visit the watering hole. Overnight stays also come with a hot breakfast and free admission to Fossil Rim’s 9.5-mile driving tour—complete with a bag of feed, which endears guests instantly to the wild residents. Back at the lodging area, a three-course seated dinner with two entrée options and a children’s menu is also available by reservation on Friday and Saturday. Nearby: Dinosaur Valley State Park, Glen Rose attractions, Paluxy River. To reach Fossil Rim, call 254/897-2960. The Star of Texas Bed and Breakfast occupies wooded, rolling hills a few miles north of Brownwood. Seven room options include a secluded cottage with hot tub, an upstairs suite with private balcony and hot tub, and Room 55—a restored 1955 Spartan Park Home travel trailer. Staying in the gleaming silver structure feels a bit like time travel. Touches such as an outdoor patio built with bricks from Brownwood’s original downtown JC Penney building help continue the illusion. Thankfully, the 1950s theme doesn’t mean guests have to give up Wi-Fi, or a microwave, refrigerator, and coffee maker. And, since this is a B&B, the proprietors deliver a full, hot breakfast (usually quiche, fruit, and pastries). and several cats often come calling. (If you’re lucky, you might also spy deer and armadillos.) Special packages include a picnic dinner complete with a bottle of wine from Brennan Vineyards in nearby Comanche; on-site massages and yoga are also available. 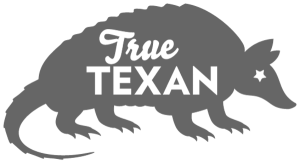 Nearby: Lehnis Railroad Museum, Lake Brownwood State Park, Rising Star Vineyards, Brennan Vineyards. To reach the Star of Texas B&B, call 800/850-2003. The owners of the 137-acre Exotic Resort Zoo, Dennis and Marilyn Bacque, originally envisioned their Hill Country property as a simple getaway spot—until they started raising animals like zebras and elk and couldn’t bear to sell the offspring. The couple changed course, and in 1995, created a preserve called the Exotic Ranch Zoo, where the animals could live in peace and the public could view and interact with them. A few years later, the Bacques began offering lodging here. Today, five cedar cabins overlook fields of grazing zebras, buffalo, elk, and other wildlife, their front porches an excellent spot from which to enjoy the unusual view. Three of the cabins have full kitchens, and all have access to an outdoor kitchen, picnic area, barbe-cue grill, pool table, swimming pool, and hot tub. A night’s stay includes a tour of the zoo in an open-sided, covered trailer, departing whenever guests are ready. Armed with a bucket of feed ($6), my daughter, Bridget, and I had many of the 500 or so resident animals literally eating out of our hands. Not content with those slobbery encounters, we picked up another bucket in the gift shop and slipped into the petting zoo for un-limited, up-close and personal attention from various deer, a llama, kangaroos, and an assortment of goats that clearly never miss a meal and don’t plan to start now. Nearby: Lyndon B. Johnson State Park & Historic Site, Lyndon B. Johnson National Historical Park, Old Tunnel Wildlife Management Area, Pedernales Falls State Park. To reach the Exotic Resort Zoo, call 830/868-4357.